With all of the different healing modalities, they can be performed either hands on, or from a distance. Just like your TV, cable TV and the internet all use energy frequencies, that we can't see in order for them to function. The electricity in your home functions the same way. All of these have to be tuned to a particular frequency in order for them to work properly. They all have ways to adjust the flow of energy built in, in order for us to turn them on or off. Or use them in different ways. All of them were thought to be too unbelieveable to be true, when we first heard of them. Distant Reiki, Healing Touch, Chakra Balancing they all work the same way. The practitioner must be attuned into the person to whom they are sending the energy too and the energy will flow. The energy will flow through the currents that exist naturally. The same way the cell phone signal or wifi signal works. Distance healing work is not a problem for energy. It travels as the speed of light. Just as it is no problem for the internet or cellphone connections. The energy that surrounds us, carries all of the energy to the intended receiver. With all these modalities, the practitioner is the conduit of the energy. I am a member of today's world of psychic healers, who use the natural body and crystals and your own energy to heal. Welcome t​o my world! ​ When Peg is working with you, she always ask for the angels to assist her in the healing. She always asks for Archangel Michael for protection, AA Raphael for extra healing, just to name a few. There are many others angels that she will call on if necessary. Otherwise they will make themselves known to her during the session. A session with Peg includes an initial brief conversation to get to know you and how she can help you. Fisrt thing, Peg will clear your energy field prior to starting. She will eith e sweep your energy field with a feather of with sage. Then she will ask you to get on the massage table fully dressed, except your shoes. You will be laying on a heated mat called a "BioMat" with a warm blanket to cover you over. While she is working on you there will be soothing music playing to help you fully relax during your session. What is important is that, this healing session is for you. So please, advise Peg if anything becomes uncomfortable, so you can talk about what you are feeling, so she can help you to resolve any issues in the moment. At the end of your session, she will have a glass of water for you. The water has had a cystal sceptor soaking in it for you to drink. The crystal sceptor is like an extra boost of healing energy in the glass. It is important to drink plenty of water after the session, because the work that had been done on you causes the toxins to be released from your body and you need to flush them out of your system in order to heal. ​All of the sessions take about 90 minutes. ​Each of the session goes to a new level of healing. Below is a discription of the differnt sessions that are availibly through Soaring Hawk Healing. Peg will start by gently holding your feet and rocking her head back and forth to connect to your energy. As she is working her way up your body, to your head, lightly touching you as she connect with your enery field, feeling for any blockages or issues. She will be working both sides of the body, one side at a time. Peg will explain to you, what it is that she is feeling along the way. Usually, it has something to do with what is going on in your life, past or present. Her goal is to help you to resolve these issues. Peg will finish the session working on your head and neck doing brain balancing. In a reiki session there are a few opening requirement that need to be done, before proceeding with the session. She will start by very gently placing her hands on your upper turso in a series of hand postions there are 7 different hand positions. Second section is the head which has 7 positions. Then she will have you roll over onto your stomach for the third and final section, there are 7 hand positions on your back, knees and feet. Peg will finish up by smoothing your energy field. She will ask you to roll back over onto your back and do a couple of closing requirements. Crystal healing and Reiki are both two very different healing modalities and yet both go together hand in hand. When Reiki and crystals are combined for healing, the results is magnificent. Having crystals along while healing with Reiki energy is like having an extra pair of hands. With a Reiki Crystal Healing Sessions is the same as above. Peg will muscle test you first with various crystals to see which crystals resonate best with you pertaining to each chakra. She will then place them on the appropriate chakras of the body. Using her master crystal and a tuning fork to bring the chakra into balance. Only positive energy flows from Peg to you. Negative energy from you is dispelled. Reiki can be used effectively immediately after any accident. If you are planning on surgery it is a good idea to have a session prior to surgery, then right after the surgery to aid in your healing. This can be done remotely. All injuries respond dramatically when Reiki is applied as soon as possible. Reiki treatments will benefit animals as well as humans. When Peg is working on your Chakras, she uses her intution to pick out the correct stones for that session. She will explain to you each of the crystals she have chosen and where she will be placing them on your body. Along with the crystals, she uses a pendulum to bring your Chakras into balance. As she is working on each of your Chakra she will talk to you about what it is she is feeling in order to bring that Chakra back into alignment. If time allows she will proceed to work on your meridians. Meridians are straight lines that run along your body from the head to the feet. What she recommend is that you have your Energy Balanced first, then she will work on the Chakras. At the end of the session she will have a glass of water waiting for you to drink to aid in flushing the toxins out of your system. The body has seven major energy centers known as chakras, and they are represented by different colors and can be assisted by different crystals. Unfortunately, due to everyday life, our chakras can get out of balance. That 's where I come in and help you- when you're not feeling quite right or you arte struggling with life, it usually corresp[onds to one or more of your chakras being out of balance or blocked. Interestingly enough, we have two sets of these chakras- you have one in the front for giving, and the ones in the back are for receiving (or letting others do for you). I have outlined for you each chakra, their location along with the corresponding colors, crystals, that aid and the archangel responsible for each one. 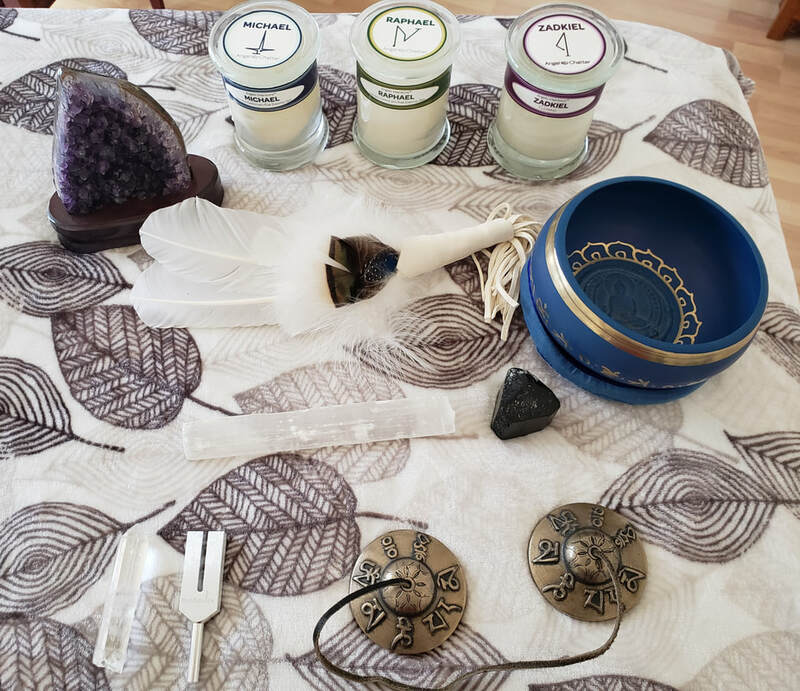 When Peg does space clearing, she uses sage for smudging, selenite for clearing. She also use Amethyst for healing and Black Tourmaline as a vaccum, to help absorb the bad juju. Peg will also light candles also along with the sage. She brings along an assortment of other crystals with her. Peg will also use her Tibetan cymbals or a tuning fork. Peg will play certain music, for the music carries particular vibrations help to clear the energies. Peg start off by setting herself up in one of the rooms. She will clear the space that she set sherself up in first, then clears herself. She will then clear the occupants of the house and the room that they are in. Then she starts at the front door and work her way around the house, room by room. First by making notes of what ever she is hearing or feeling in each of the rooms. Peg will crack a couple of windows so that the bad energy can escape. She will start at the front door clear and seal the door. Then she will proceed to work her way room by room aound the entire house. In each of the rooms, starting at the door to the room, she will clear the walls, windows, the closets. She will even sweep the bed or beds using selenite. Your/our bed hold alot of energy. When she is done in that room she will seal it. She do this with each room. When she is done, sshe will go back and recheck each room to make sure it is cleared. When finished she will close up the windows to keep the bad energy out. She will then make her way outside and clear the perimeter of the house and the yard, for bad energies will be lurking outside too. If there are any pets she will clear them too. Because enegies like to attach themselves to your pets. This is where Peg will use selenite on them. It is a good idea to clear the cars too. For we do get quite angsty when we drive sometimes. She will finish up using one of the brass bowls to make sure all is well healed. Energy is energy. We leave our energy where every we go. Have an argument, yell, scream, cry. Well It sticks to the walls windows, floors, furniture. ​Space clearing, cleans and freshens the enviroment. If something traumatic happens in the house, then it is imperative to have the space cleared. Because the trauma will remain in the space until it is removed. Just like dropping a pebble into a pond it ripples out through all space and time. Energy is the same. I am a Certified Archangel Intuitive. When I do a card readings or tablet readings the infomation on the cards comes from the angels. The Archangels give me more information through the cards to help you recognize issues in your life and to help you move forward. These messages are from the angels. Each reading will be different can take anywhere from 30 minutes to an hour..